Rebecca (R.L.) Nolen lives with her family, a large dog, and two cats in a hundred-year-old cottage in Houston, TX. She writes under the name R.L. Nolen for her adult novels (the upcoming psychological suspense novel Deadly Thyme, set in England) and Rebecca Nolen for her children’s books (The Dry, a suspenseful middle grade historical fantasy). 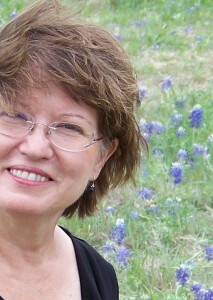 Rebecca is a longtime member of SCBWI, Houston Writers Guild, Sister in Crime, and the Mystery Writers of America. She is a master gardener, and at one time worked writing ads for an insurance company. She was born loving all things British. Part of this phenomenon occurred because of family tales of Kings and castles in the family ancestry. Alas, it was a lie. But that did not deter her pursuit of loving Britain. Beginning at age twelve, she read every British murder mystery, cozy, suspense, and thriller that she could get her grubby hands on. And thanks to Netflix all the best Masterpiece theater shows, and BBC productions are available for viewing, which makes for nice long weekends with a cup of hot tea and a dog to keep her feet warm. Rebecca’s idea for The Dry began in her back yard as she observed the daily war between the wasps and the caterpillars, or the wasps and the spiders. Her observation led to a study of insects in general and an extensive bug collection. Then, on a visit to Oak Ridge, Tennessee, she was moved by photos of the children who worked in the coal mines in the last century. The coal mines in the U.S. might not use children now, but in other parts of the world children are being exploited.